This week I saw one of my colleagues carrying around a copy of 1984. "Oooh," I said. "Are you teaching 1984?" My mind instantly raced back to the days when I taught Orwell at my school in Bulgaria, learning so much every day about my students and their families' actual recent history with communism. "Yeah," he said. "I've never been so excited to teach it." And for good reason. You've no doubt noticed Orwell skyrocketing to the top of the bestseller lists in this country as we all deal with the surge in fake news and the suddenly blurry (or is it?) question of what is and is not true. Newspeak has never felt more relevant in this country. If you are teaching Orwell, my guess is you'll have highly engaged students. I first taught Orwell in Sofia, Bulgaria. The first year I lived there I didn't quite understand just how fresh my students' history with communism was. Sure I had seen the missile sculptures at the playground by my apartment in Mladost. I passed the stray dogs everywhere in the city who had descended from pets let loose when families simply could not afford to feed them in the Communist era. But I hadn't quite processed it all. My Orwell unit came and went and it was not particularly amazing. By my second year I had talked at parent-teacher conferences with the translator for the former Communist party leader. Her daughter was in my 10th grade English class. By the second year I understood that to teach 1984 in Sofia without discussing recent history and family experiences was like teaching cooking without a kitchen. My students had explosive opinions to share about Orwell's depiction of communism. We began to explore the concept of propaganda very closely, both the party propaganda showcased by Orwell, and the idea that 1984 itself was in some ways anti-Communist propaganda. Some students were nearly in tears as they argued that communism simply wasn't that bad. 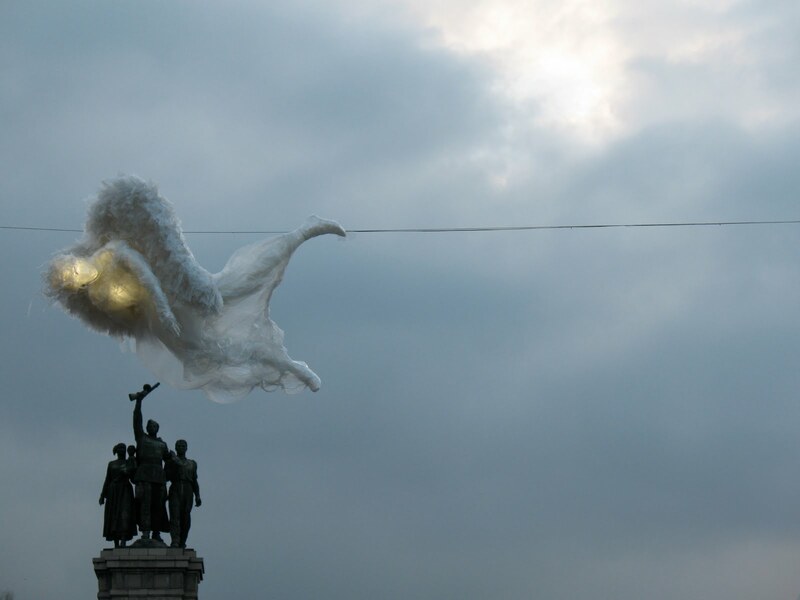 Another very quietly shared that the party had "disappeared" her grandfather. 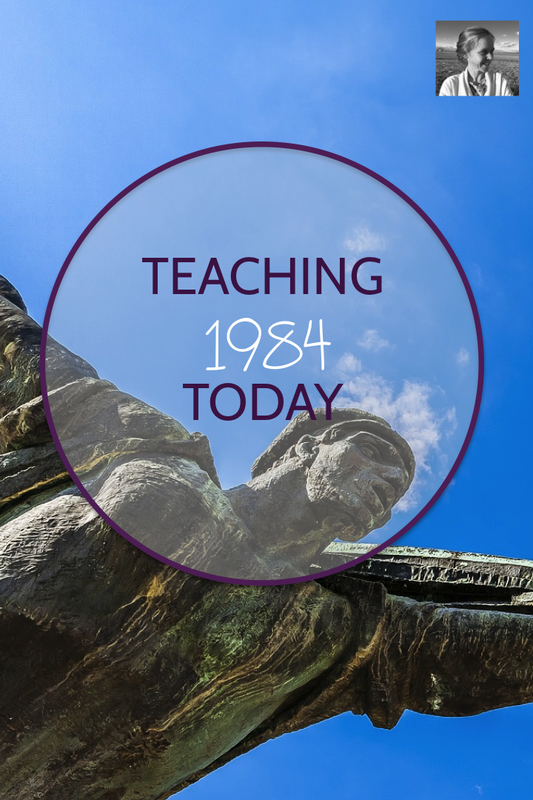 If you are teaching 1984 in the United States today, I believe your discussions will be just as rich and important as they were for me in Bulgaria. The novel's concepts of truth, propaganda, and individuality cry out for connection to the modern world as never before here. I was intrigued to see this article in The Atlantic sharing one teacher's perspective on "Teaching 1984 in 2016." 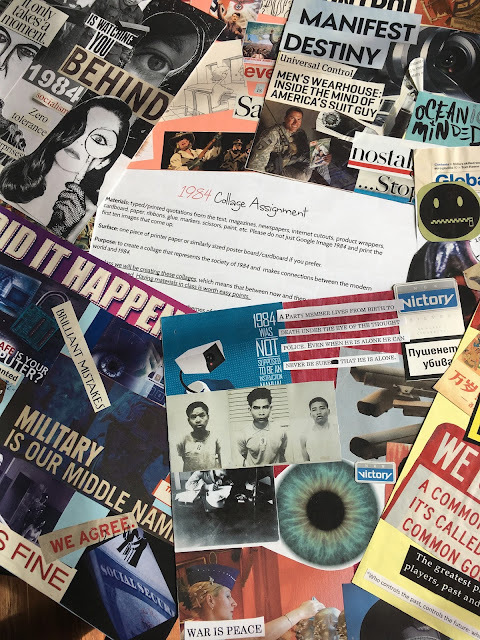 One way to help students connect modern day issues to the major points of 1984 is to do a collage connecting Orwell's themes with modern media. I have students choose key quotations and then find images from newspapers, magazines, or the internet to help illustrate these quotations. 1984 collages done now can include a great deal of thought-provoking connections between our modern world and Orwell's terrified fantasy. You could even let students create a connecting blog or multimedia presentation so they could include related video and audio content. Another connecting activity I love for 1984 is to do a comparison of two commercials that have used 1984 as the foundation of their product pitch. Apple actually introduced their computers for the first time with a commercial inspired by 1984, showing how their computers would be different, which of course has continued to be a huge theme for them ever since. Amusingly, Motorola later did a similar commercial, except that the 1984-esque world they used was actually a world in which everyone was using Apple products. So a Motorola product was the new opportunity to be different. I've created an activity based on these commercials if you'd like to use it, or you can invent your own. Here are the commercials. You'll hardly believe them. Try some student-led discussions on 1984 too. Let students sit in a circle. You could try Harkness discussions or a Fishbowl discussion. 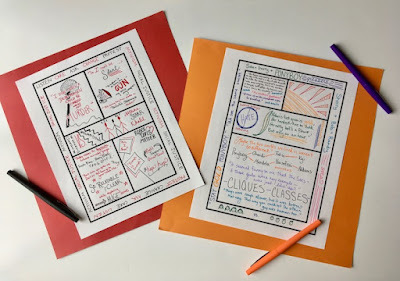 Perhaps let students warm up with an activity in which they connect a modern news article of your choosing to the text. Then open up the discussion. If you have a quiet class or a class that is very entrenched in their roles (with some dominating, some distracted, etc.) you might consider trying out discussion role cards to help change up your dynamics. This is one of my favorite ways to help a class examine and improve their own dynamics. If you've never taught 1984, I do believe this is the right moment to add it to your curriculum. Students need to be thinking about Orwell's themes in an era when fake news is suddenly everywhere and different people seem to believe different ideas can be the truth at the same time.